More than 550 cars gathered for AlfaCity07, Central Europe’s biggest Alfa Romeo event, which took place in Esztergom (Hungary) last weekend. But this during this edition of the rapidly-growing event it was not just the massed ranks of Alfa Romeos that captured the attention. A Lamborghini Espada, a Lancia Delta Integrale and a Ferrari F430 Challenge race car were also big stars of the Hungarian meeting alongside two original former Italian "Carabinieri" 75s, a glorious Montreal from 1971, a black RZ which had come from Switzerland to take part and of course the newest Alfa Romeo, the Spider which was brought to the event by the national importer of the brand, and the main sponsor of the event, Fiat Auto Magyarország Kft. 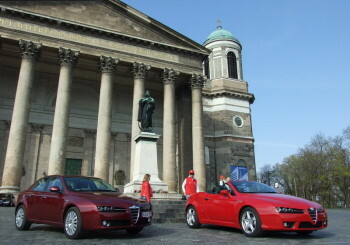 The centre of the little town of Esztergom was turned into a real "Alfa City" for the gathering last weekend, hence the event's new name, AlfaCity07. Hungarian Alfisti set another record this year, never before had come so much Alfa Romeo cars to an event being held in the region. It wasn’t an objective of the organisers to set up a meeting with so many participants arriving, but this now-annual meeting has the curiosity and a rapidly-building tradition in Hungary. So it wasn’t a surprise, that more than 550 cars gathered for this event. The 31st of March, the date chosen for AlfaCity07, was also the first day of good weather this year, and the AlfaAmore.hu website was also celebrating it’s 3rd anniversary too. More than a hundred participants came from the surrounding countries, such as Slovakia, Serbia, Croatia, Austria and Germany. 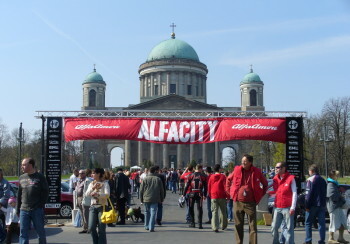 The centre of the little town of Esztergom was turned into a real "Alfa City" for the gathering last weekend, hence the event's new name, AlfaCity07. More than 550 cars, led out by the brand new Alfa Spider, gathered for AlfaCity07, Central Europe’s biggest Alfa Romeo meeting, which took place in Esztergom (Hungary) last weekend. The biggest Hungarian Alfa Romeo car and accessory suppliers introduced themselves to the visitors at the AlfaCity07 event with an array of stands and displays, including Csigi-Bege Autópláza, Autóház Budaörs and Autófórum Riegler.